Silver Plated Crucifix oxid Nail Cross with a 24 inch Chain..
2 5/8" polished Stainless Steel Flared Cross on a 24" silver rhodium chain in poly bag.Product Size:..
OLIVE WOOD CELTIC CROSS WITH BROWN CORD, MADE IN ITALY, CARDED 1 3/4"..
4" X 2.75" X 1/16" gold plated pectoral Latin cross on a thick 30" gold plated chain. Comes packag.. 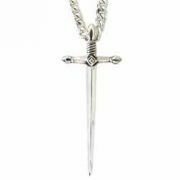 This sterling silver cross necklace features a striking sword design in the shape of a cross. 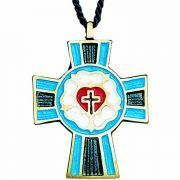 Comes ..
1" gold plated Luther Rose pendant with inlaid enamel colors. Comes on a 24" gold plated chain pac.. 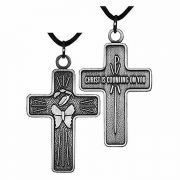 Stainless Steel, high polish 2 piece shield cross with engraving and black enamel filled wording rea.. 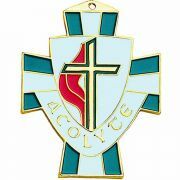 Traditional Chrysalis Cross. 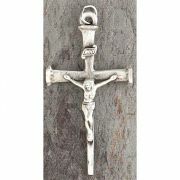 1 1/2" antique silver plated traditional cross. 2 sided design, black c.. The Rose Symbol. Solid 2 1/4" polished bronze pendant with hand enameled color on a sturdy cord. 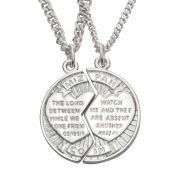 In ..
Nk-SP Cardinal's Song Heart Locket 13/16 inch X 3/4 inch 18 inch chain.. Description: RCIA (Right of Christian Initiation for Adults) is the process through which adults ..
Cross reads: Our Father, who art in heaven,&..
Upgraded Solid Stainless Steel cross with high polish finish outer frame and silver middle. Front an..
We are pleased to make available an extensive col.. 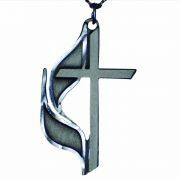 This Christian jewelry design is the perfect present for a loved one; you keep one side, and give .. Deep engraved Front Monogram message I heard the voice of the Lord, saying, "Whom shall I send, and .. Deep engraved Front Power Point message "Love is patient, love is kind, it does not envy, it is not ..
Customize with your Favorite Bible Verse! 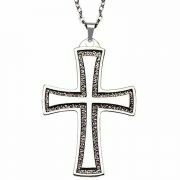 One of Spirit and Truth's most popular items! Plate size 1..
United Methodist Acolyte Cross Pendant, 2 1/4", gold plated with enamel colors on 28" cord in poly b..
2" UMC Cross and Flame pewter plated pendant on a 24" antiqued pewter plated chain. 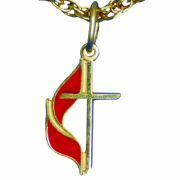 Packaged in poly..
3/4" gold plated and enameled UMC cross pendant on a 24" gold plated chain. 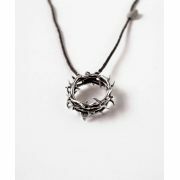 Choice of chain size 18"..
Made from the finest sterling silver and features a detailed Crown of Thorns design. Comes on a 20 i..